Hazel was an important tree-fruit in ancient Ireland. The Irish countryside was once covered with Hazel (Corylus avellana), an important source of carbohydrates and protein. The nuts could be stored for up to a year, making them a critical Winter food source, and they were widely traded. The Hazel was classified as Airig Fedo, one of the “nobles of the wood” in the Bretha Comaithchesa, the main law text on farming. It was a valuable tree due to its nuts and the strong and pliable rods that could be taken from it to be used for fences and house walls (wattling). One cartload of rods a year was part of the rent a client owed to his lord, which probably included both Hazel and Willow (Sally rods were used for thatching and basket making). Finally the Hazel features as an aspect of the legal system in ancient Ireland. The smallest liquid measure mentioned in the laws is “the halfshell of a hazel nut.” This measurement was used in determining compensation due to victims of crime, depending upon the amount of blood they had shed. Half of a hazelnut shell was said to hold five drops of blood. The herbalist Nicholas Culpeper recommended powdering the nuts and mixing them to a paste with mead or honey water for coughs. Adding pepper to this “electuary” helps to expel mucus from the sinus passages.10 Among the Celts, Hazel nuts were chopped and added to oatmeal as a strengthening food for invalids. Hazelnuts are said to benefit kidney infections when eaten. The Huron Indians used the bark (of Corylus rostrata) in poultices for ulcers and tumors. The Iroquois mixed hazelnut oil and bear’s grease to make a salve that repelled mosquitoes. The Chippewa made a decoction of Hazel root (Corylus americana), White Oak root, Chokecherry bark, and the heartwood of Ironwood for bleeding from the lungs. The Ojibwa boiled the bark and used it to poultice wounds. The Mohawk made a tea of young Hazel stalks and Field Horsetail root to relieve teething pains in babies. Hazels figure strongly in Celtic magical tradition. There are stories concerning a sacred Well of Knowledge surrounded by the Nine Hazels of Wisdom. The well is said to be under the ocean, in the Otherworld, or at the source of several rivers in Ireland. The Seven Streams of Wisdom (the perfection of all the senses) flow from this well, and back to it again. The Nine Hazels that hang over the well represent wisdom, inspiration, and poetry. The trees put forth leaves, flowers, and nuts simultaneously, which fall into the water to be eaten by the Salmon of Wisdom who swim in the well. For every nut a salmon eats it develops a spot (possibly a reference to a lost series of initiations or poetic grades), and any person who eats one of these magical salmon will become wise. The waters of the well develop bubbles of inspiration from the dropping nuts. The bubbles then flow out to be drunk by all people of arts (Aes dana). The hero Finn mac Cumhaill gained his prophetic powers and wisdom by eating a Salmon of Wisdom that had fed on the hazelnuts that dropped into the Well of Segais. This happened when Finn was a young apprentice. His teacher, the seer Finnégeas (Finn the Seer), had captured the salmon and intended to eat it himself in order to gain its knowledge. He set his young apprentice Finn to watch the cooking salmon. As it cooked some of the hot juices popped onto Finn mac Cumhaill’s thumb, which he immediately put in his mouth to salve the pain (this begins to look a lot like the druidic art of Teinm Laegda described earlier). Finn instantly gained the knowledge of every art. In rivers there is a mysterious reverse current that salmon utilize in their ascent of waterfalls and rapids. Th e Salmon of Wisdom who venture out into the Great Sea of Life unerringly return to the Source, an inspiring feat for any seeker of wisdom. This process is related to the Druidic art of going within to find the answer to a problem. The Hazel symbolizes the hard work of attaining knowledge, that is, breaking the hard shell to get at the sweet meat inside. Ancient Druids and early Irish Bishops carried Hazel wands. Aengus Og, the Celtic Young God of Love, carried one as well. So revered was Hazel among the ancient Celts that a tiny twig was enough to protect a home from lightning strikes or a ship from being lost at sea. A Hazel collar worn by a horse was said to protect it from ill-intentioned Fairy folk. At Beltaine (May Eve) in ancient Ireland, cattle were driven between two ritual fires as an act of purification. Hazel rods singed their backs as they passed between the pyres. Hazelnuts were a common postglacial food for the Indo-Europeans. Hazel wood was used to make spears for small game such as hares. Hazel shoots were used as canes, barrel hoops, fishing poles, roasting spits, and wands and scepters of authority. Hazel is a tree of choice for water witches, or dowsers. A forked Hazel twig can be seen to tremble when a current of water is crossed. A Hazel divining rod cut on St. John’s Eve was used until the sixteenth century to detect thieves. The Spirit of Hazel is one that helps us to divine the mysterious unseen Source of all things. "Hooray! A book that tells us how to pronounce a tongue-twisting Celtic phrase like Craobh a b'áirde de 'n abhall thu . . . the whole book is interesting to read, with its accounts of life and magic in Celtic Ireland." "The herbal remedies will be of great use to myself, and to anyone who decides to read the book. . . . this will be a cherished addition to any Neo-Druid's library." "As a guide for Celtic Reconstructionists, this book is invaluable. . . . Hopman's version of the Ogham meanings and use is just one of many; yet this book is so well researched and written that one cannot help but see the truth." "Hopman is an incredible resource for all of us seeking to take our health, medicine, and spirituality into our own hands. 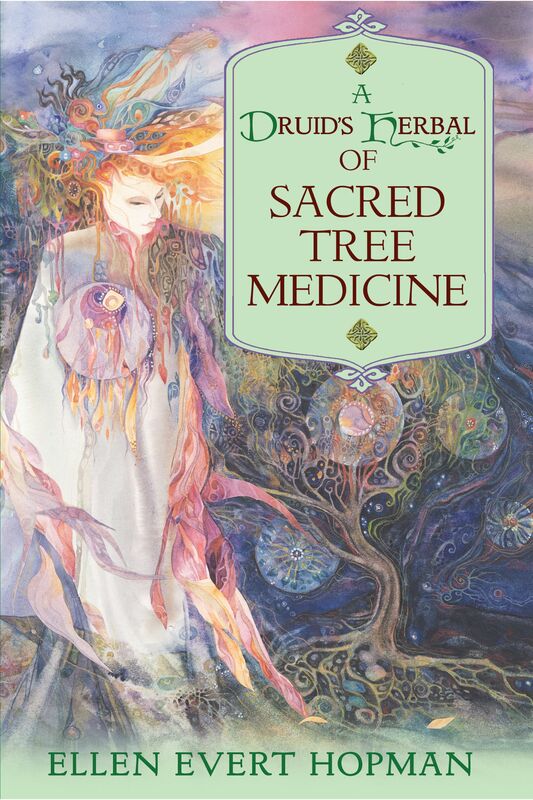 A Druid's Herbal of Sacred Tree Medicine deserves a place on the shelf next to her other guides of magical and medicinal love."